Why Isn’t the Tooth Dead? Every tooth in your mouth is alive. As a result, they can die. Often, their survival is compromised due to an infection, deep decay, or a significant break. When one of these issues causes damage to extend past the crown to affect the inner most layer of the tooth known as the pulp, the only way to save the dying tooth is with a root canal. The pulp is the nerve center of the tooth, which also contains blood vessels. A root canal will remove the pulp because it cannot repair itself and will eventually die. If the pulp dies completely, it can lead to an infection in the root canal. This can lead to serious pain and swelling. To stop the discomfort and future damage, the pulp will need to be removed. Although it is necessary while a tooth is still developing, it can survive without it after it has fully developed. After an initial consultation with your dentist in Asheville, you will be scheduled for your procedure. During your first visit, a local anesthesia is used to numb the area. Then, dental tools are used to open the crown of the tooth. Areas of damage and decay will be taken out, as well as the pulp. The root canals are cleaned and sterilized prior to being sealed with a special material known as gutta-percha. Now, the tooth’s health as been restored, allowing it to thrive. To repair its function and appearance, a dental crown is often needed. This is a custom-made cap that is placed over the tooth. To create it, impressions are taken after your root canal procedure. It will be made in a dental to match your exact size, shape, and color needs to blend in seamlessly with your natural teeth. While you wait for the crown to be ready, a temporary one will be put in place. 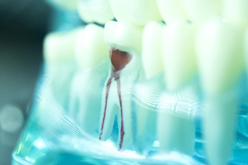 In a couple of weeks, you will return for another appointment to have your final crown bonded to your tooth. Do not let a dead tooth ruin your smile. Save it from needing to be removed with root canal therapy. Dr. John White provides comprehensive dental care to the community to create healthy smiles. In addition to preventive services, he also provides endodontics in Asheville to rehabilitate damaged teeth. If you need a root canal, do not wait until it is too late. Contact our office today to schedule your consultation.